Purple Pikmin (紫ピクミン?) are the second type of Pikmin found in Pikmin 2, and a type of Pikmin usable only in non-story game modes in Pikmin 3. Their most noteworthy characteristics are their massive weight and carrying strength – 10 times those of a regular Pikmin. They are specifically required to obtain a number of treasures, two of which are needed to gain access to new areas, making them necessary to complete the game. 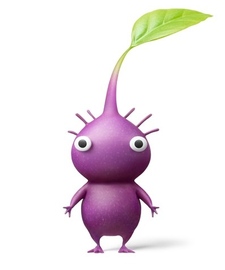 Their defining physical characteristics are their purple color, as the name would imply, as well as their bulbous physique when compared to other Pikmin, in addition to the straight trichomes atop their heads. On top of serving as 10 Pikmin in some tasks, they are slower than normal, and have a unique way of attacking enemies in Pikmin 2. Purple Pikmin share a number of similarities with White Pikmin. Firstly, they can only be obtained via certain Candypop Buds, in this case Violet Candypop Buds, and have magenta flowers rather than white. In addition, at the end of each day, they are stored in the Hocotate ship. Purple Pikmin showing off their strength. Purple Pikmin weigh ten times as much as a regular Pikmin, making them useful for puzzles like seesaw blocks. As a result of their weight, they are thrown at a lower arc, and are not knocked back by the windy attacks of the Puffy or Withering Blowhog. Their weight also helps them keep themselves upright, and prevents them from tripping quite as often as other Pikmin types. Some airborne enemies can be weighed down with a certain number of Pikmin, and Purples count as 10 for this purpose as well. This means that enemies that fall with a weight of 10 Pikmin on them can be brought down with a single Purple Pikmin. Their weight, however, slows them down a lot, even as flowers. Purples cannot move as quickly as other Pikmin types, and move even slower when carrying items. This can result in a player accidentally leaving a Purple Pikmin behind, especially in the leaf stage, while crossing an area. Despite their weight, Blue Pikmin can grab them and shuck them out of water just fine. These Pikmin have the strength of 10 Pikmin, making them not only helpful to retrieve objects without using up a large number of Pikmin, but also mandatory for the collection of some treasures that require over 100 Pikmin in strength to pick up. In Pikmin 2, when thrown, they will land with a resounding thump, stunning and seriously injuring larger beasts nearby, and fatally injuring smaller, more fragile creatures such as Shearwigs and Dwarf Bulborbs. In addition, they do not need to be precisely thrown at their target, as a small homing system will swerve the Pikmin's fall and make it land on a nearby enemy. Most enemies have a one in three chance of being stunned, and stay stunned for a full five seconds. Some bosses are harder to stun, or may not be stunned at all, whereas other enemies might be stunned more or less easily, and for different durations of time. This strong landing destroys eggs immediately, defeats Mitites in a wide radius, and can instantly deactivate fire geysers and electrical wires. This, combined with the naturally strong impact damage, makes Purple Pikmin the strongest Pikmin to use in a fight. Because the "thud" counts as an attack, it can be used to damage gas pipes and Fiery Blowhogs, given that although the Pikmin cannot latch on or attack with its stem due to the hazards, they can still cause damage, despite being put in risk of death right after. These Pikmin possess the strange ability to anchor extra-dimensional entities such as the Waterwraith to the current dimension for a brief period, although this has never been explained in detail. They also do not panic when encountering Mitites or hearing the roar of Emperor Bulblaxes. Interestingly, they stay latched on to Dwarf Red Bulborbs, Dwarf Bulbears, and other similar enemies, if they are thrown on top, and only let go when the enemy's death animation is over. In Pikmin 3, however, many of their iconic traits are no longer prevalent. They no longer deal more damage than Red Pikmin, nor do they stun enemies on impact. Despite this, they still stop to perform a pound move even though it does no extra damage. In addition, they have a slight delay when thrown to latch onto enemies after their "ground pound", as if they are waiting for a non-existent stun. They also lost their wind resistance as proven by the Puffy Blowhog in Twilight Hollow, and can no longer instantly weigh down airborne enemies as confirmed with the same creature. These changes turned what once were great fighters into more of a nuisance. Also, because no enemies are able to scatter Pikmin like the Mitites, it is unknown if they are still immune to panic fits. As a result, the main use for Purple Pikmin in Pikmin 3 is purely for carrying purposes. Purple Pikmin when first discovered in the Emergence Cave. Purples are only truly "discovered" in Pikmin 2. When Olimar and Louie venture into the Emergence Cave, they see the top half of a globe, but it requires more than 100 Pikmin to lift – it needs 101. They venture further through the cave, and find a pair of Violet Candypop Buds. After throwing some Red Pikmin in them, they discover the Purple Pikmin, which they then learn are fierce fighters and can carry 10 times their weight, allowing them to retrieve the otherwise "unliftable" treasure. Although Purple Pikmin do not appear in Pikmin 3's main story, they do occasionally appear in Mission Mode and Bingo Battle. The most notable stage with Purple Pikmin is Thirsty Desert Remix, which features nothing but Purples and some Candypop Buds. Purple Pikmin are mandatory in collecting the following treasures and defeating the following enemies, as no other Pikmin type can take on the task, not even with exploits. Spherical Atlas: The first "new area" treasure in the game requires 101 Pikmin to carry, meaning some Purple Pikmin will have to be used. Geographic Projection: Same as the Spherical Atlas. Professional Noisemaker: The treasure is inside the Waterwraith, which requires Purple Pikmin to defeat. Doomsday Apparatus: This treasure requires 1000 Pikmin to carry, or 100 Purple Pikmin. Waterwraith: The creature is invulnerable, but Purple Pikmin stomps make it vulnerable to all Pikmin attacks. Although Purple Pikmin are not completely mandatory for the following tasks, they are expected to be used for them. White Flower Garden: Before the entrance to the cave, there is a paper bag that requires 200 Pikmin in weight to be crushed. Though, it's possible to enter the cave without Purples by going out of bounds. Retrieval of the Doomsday Apparatus treasure in Pikmin 2 requires the use of 100 Purple Pikmin. The best place to get so many would be the Subterranean Complex. Take a single Pikmin into that cave and skip through the sublevels until you reach the eighth one, with an exit geyser, Candypop Buds and some eggs. Use the Queen Candypop Buds first and the Violet Candypop Buds after to produce 15 Purple Pikmin and 2 Red, Blue or Yellow Pikmin. Or, if you are also trying to increase your White Pikmin count, bring 21 Pikmin and throw 20 of them into the Ivory Candypop Buds on floors 3 and 4 to gain 20. When you reach the 7th floor, throw the last non-White Pikmin into the Queen Candypop Buds first and the Violet Candypop Buds after to produce 15 Purple Pikmin and 2 of the primary type of Pikmin. Purple Pikmin, like White Pikmin, can only be found in Pikmin 3's Mission Mode and Bingo Battle stages, and even then, only in some of them. This list contains all levels with Purple Pikmin, either ready to use, or available through Violet Candypop Buds. Silver Lake – Collect Treasure! Thirsty Desert – Collect Treasure! Twilight Hollow – Collect Treasure! Fortress of Festivity – Collect Treasure! Beastly Caverns – Collect Treasure! Inside the text files in Pikmin 2 are some settings that specify some of the Purple Pikmin's behavior towards enemies and vice-versa. Most enemies and objects suffer 50 points of damage whenever a Purple Pikmin lands vertically on top of them, from a throw. There are a few enemies and objects that only suffer 10 points of damage, however: Segmented Crawbsters, Waterwraiths (as well as their rollers), Emperor Bulblaxes, and bomb-rocks. 100% chance: Fiery, Caustic, Anode and Munge Dweevils. 0% chance: Waterwraiths, Empress Bulblaxes, Toady Bloysters, Ranging Bloysters, Mitites, Men-at-Legs, Beady Long Legs, Volatile Dweevils, Titan Dweevil, Raging Long Legs, Breadbugs, Giant Breadbugs and Segmented Crawbsters. Enemies become stunned for 5 seconds, with the following exceptions, who get stunned for 10: Watery and Fiery Blowhogs, Male and Female Sheargrubs, Shearwigs, Skitter Leaves, Dwarf Red Bulborbs and Emperor Bulblaxes. Segmented Crawbsters, Breadbugs and Giant Breadbugs have a specific 0 second stun period on top of their 0% stun chance. Honeywisps, Lithopod rocks and rubble do not receive damage like normal, but still have the Purple Pikmin stomp damage setting set to 10. Honeywisps, Lithopod rocks, rubble, and the Waterwraith's rollers have their stun chance set to 5%, even though they cannot be stunned. Waterwraiths and the rollers have their stun time set to 60 seconds, even though the former has a 0% chance of being stunned, and the latter is not an enemy. Empress Bulblaxes have the stun time set to 10, even though they have a 0% chance of being stunned. Honeywisps, rubble, Lithopod rocks, eggs and bomb-rocks also have the stun time set to 10, even though the first faints after a single attack and the rest are not enemies. Mitites, Toady Bloysters, Ranging Bloysters, Men-at-Legs, Beady Long Legs, Volatile Dweevils, Titan Dweevils and Raging Long Legs have a 0% stun chance, but still have their stun time value set to 5. Fire geysers, gas pipes and electrical wires have their stun chance set to 0%, but the stun time set to 5, even though they are not enemies. 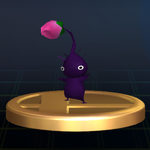 Purple Pikmin fight alongside Olimar in Super Smash Bros. Brawl and Super Smash Bros. for Nintendo 3DS and Wii U, as well as having trophies based on them. Here, they have the shortest throw distance and the smallest grab range. When thrown at an enemy, rather than latching on, Purples will deliver a blow with knockback, stopping the opponent in their tracks. They are the most durable Pikmin of all and deliver the highest amount of knockback in Olimar's smashes and aerial attacks. Purple Pikmin are also the only Pikmin that will be plucked by Olimar in Home-Run Contest. They also appear as a sticker in Brawl. “A type of Pikmin, much heavier and slower than other Pikmin. When thrown, they impact with such force that they may kill or stun enemies. They're also incredibly strong—one of them can carry an item that normally would require ten Pikmin. While they're more powerful fighters than their red cousins, their slow speed hampers their effectiveness. “These purple Pikmin are the strongest, but they're also slower and heavier. In Pikmin, they can be thrown at animals to stun them! In Smash Bros., they're great for attacking and launching, but they've got a pretty short reach. Get close to your foe to make these little ones truly effective! “These purple Pikmin are much stronger than their colorful counterparts, but they're also slower and heavier. In Pikmin, they can be thrown at animals to stun them! In this game, they're good at both attacking and launching, but since they haven't got good reach, you'll need to get up close and personal with your foes first! A close-up of a Purple Pikmin as seen in Pikmin 2. A Purple Pikmin carrying a red berry. Artwork of a Purple Pikmin's different stages of maturity from Pikmin 2. Artwork of a Purple Pikmin's second stage of maturity. Clay artwork of a Purple and a White Pikmin from Pikmin 2. A Purple Pikmin shown on the expanded box art for Pikmin 3. Purple Pikmin's abilities explained in the manual of Pikmin 2, Pikmin 3, and New Play Control! Pikmin 2. A Purple Pikmin in Super Smash Bros. Brawl. The Purple Pikmin carrying the Massage Girdle is smaller than the one standing behind Louie. Purple Pikmin's models shrink down when carrying objects in Pikmin 2. White Pikmin also grow in size. One of the many Onions seen in the good ending of Pikmin is purple. In Pikmin 2, the standby icons for leaf and bud Purples lack hair. In Hey! Pikmin, the Onion shows a purple and white color on it, meaning that Purple and White Pikmin have shared Onions with the five other Pikmin types. There is evidence to suggest that Purple Pikmin were originally planned to be black, as the internal name of the Violet Candypop Bud is BlackPom (the Ivory variant is called WhitePom). Furthermore, the Waterwraith's internal name also references this absent color, with BlackMan; upon being struck by a Purple Pikmin, the boss becomes a color reminiscent of their skin, which could imply that it would have also turned black had the Pikmin retained their coloration. Finally, in some prerelease screenshots the standby Pikmin icon for Purple Pikmin is a black-painted Yellow Pikmin, and one can also see that Olimar's Pikmin cursor is black. This article was a featured article from February 23rd to April 12thth, 2011. This page was last edited on April 3, 2019, at 16:19.